Actually, that is what we were trying to find, but the observation was much sooner then we expected. 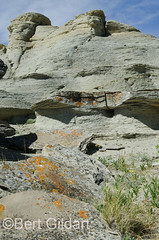 Several years ago our good friends, David and his wife VV, told us about a rattlesnake den they’d found while hiking. David said that subsequent to that time they’d often returned, for in the spring they had seen literally dozens of snakes near the mouth of the den. At this time of year, they were intertwined, still sharing the warmth of one another’s bodies. But this year was different. Warm summer-like weather elevated temperatures and some snakes had apparently already left the den. Still, we hoped some remained, and we continued our hike, passing a hole into which Janie’s snake had quickly disappeared. “Snakes,” said David, “are generally defensive. Given a chance, they’ll always scurry away. Thirty minutes later we approached a rock-strewn slope. 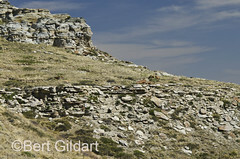 It was located on the south side of a hill and so was warmed by the winter sun. And, yes, we saw snakes, almost immediately. 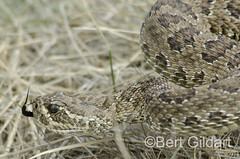 They were the western prairie rattlesnakes, and almost immediately they began to rattle. 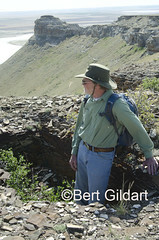 L TO R: Rattlesnake country is beautiful country, highlighted by sedimentary rock often covered by colorful lichens; rattlesnake den in center of photo and at bottom; David surveying country from inside an eagle pit, once used by Native Americans for capturing eagles. They were under rocks and in the crevasses of our sandstone hill. But as we suspected, many had apparently departed, for last year at this time David had seen literally dozens of snake intertwined like so much spaghetti. These snakes, however, were not happy about our presence. Simultaneously, one elevated its tail and head and we gave it a wide berth until it settled down. Then with a long telephoto lens I approached it. I wanted a close-up shot and because the close focusing distance of my lens was about eight feet I inserted an extension tube and was able to approach within about six feet. David, who has made a study of snakes said they can’t strike more than about half their body length, and I was well beyond that distance. 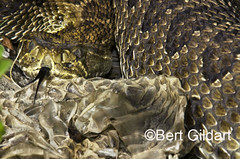 Rattlesnakes are classified as pit vipers, and the close-up images shown here reveal these pits just below their eyes. They serve as heat sensors and when hunting, the pits inform snakes where they should strike their prey. These pits have an effective range of approximately one foot, but they provide the rattlesnake with a distinct advantage in hunting for warm-blooded creatures at night. One of the snakes posed nicely beside a translucent sheath and I realized it was a discarded skin, though probably not a recent one. As snakes grow they shed their skins, and apparently do so several times a year. Later I found a baby rattlesnake and David said to be careful. “Before they can rattle,” said David, “they must have two rattles.” This one had but a “button,” a single rattle. Though it could shake its tail, there was nothing for the one rattle (the button) to rattle against. L TO R: Click pictures one and two for larger image and to easily see “pits” of snake located just below eyes. Though rattlesnakes are defensive, when approached too close, they will assume aggressive posture, showing head elevated, tongue out and tail up. 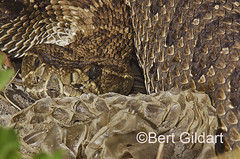 Rattlesnakes travel with their rattles held up to protect them from damage, but in spite of this precaution, their day-to-day activities in the wild still cause them to regularly break off end segments. As a result there is no correlation between age and the number of rattles. 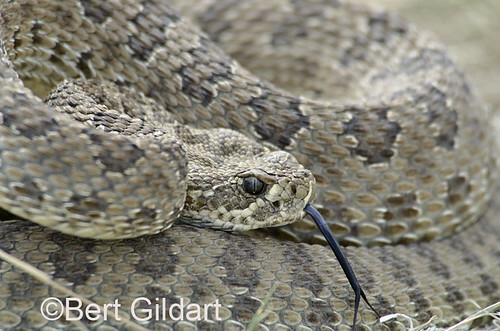 Unlike many other snakes, rattlesnakes give birth to living young. In other words, they are, according to an old college professor of mine, “viviperous.” Depending on size and age, females rattlesnakes produce from 10 to 20 young once every two to three years. Most young don’t make it past their first year, and are preyed upon by a variety of different birds. Rattlesnakes are also destroyed by people, and as we returned from our trip, a fellow drove up in a rundown truck and said he was out killing snakes. “I’ve gotten two already,” said the fellow with a glazed look of one who had just stepped out of a bar. As snake defenders we said that without them the country would be overrun with rodents. Realizing our opinions differed the man jammed his truck into gear and spun off in a cloud of dust and small rocks. “So much for jerks,” we said, and recounted our day’s activities discussing the eagle pit (used by Native Americans to capture eagles) we’d seen and the beautiful country through which we hiked. We were also fascinated by the incredible biology of snakes and concluded we’d had a most successful day. This entry was posted on Friday, May 18th, 2012 at 8:04 am and is filed under Montana Photography, Natural History/Conservation, Photography, Travel, Uncategorized. You can follow any responses to this entry through the RSS 2.0 feed. You can leave a response, or trackback from your own site. Nice pics. Who did you get th hold the strobe lights and to tickle the snake this time ? I know Janie wouldn’t do it!